My father never signed me up for Little League or Boy Scouts or karate lessons. Instead, 25 years ago today, he sat me down to watch the premiere of the follow-up to a show he watched as a boy: Star Trek. The debut of The Next Generation in 1987 marked the first return of the show to television since The Original Series went off the air 18 years earlier. 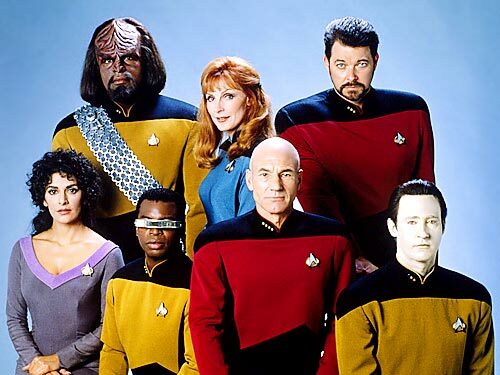 With TNG, Star Trek remained on TV for another 18 years, until the cancellation of Enterprise in 2005. It remained a weekly tradition for me and my father for that entire time, more than half my life thus far, and has defined more of my interests and ambitions than I can measure. They boldly went — and took me and my dad along for the ride. TNG is now being re-released on Blu-ray DVD, including several bonus features, such as "The Origins of The Next Generation". "There are a lot of issues and challenges in the Eighties and Nineties and the end of the century that need talking about — and they need talking about in drama, because drama will move people, cause people to think much more than any street show," said Star Trek creator Gene Roddenberry. In the course of addressing those issues, Roddenberry and crew created some wonderful, memorable stories featuring a talented cast. I recounted many of them in a special package that friends Peter Watson, Gene Demaitre, and I put together for the show's 20th anniversary in 2007, but at no point did I specifically name my favorite episodes. Since the cast and crew of TNG recently identified their favorites, I figured I should, too. So finally, out of 178 episodes, here are 14 that, in no particular order, stand out in my memory. Filed under Films; 7 comments. In 1983, personal computers were in an exciting infancy. The Apple II, Commodore 64, TRS-80, and more made for a diverse digital landscape in which to explore, create — and hack. We didn't know what "security" meant other than simple passwords, and the necessity of direct connections in that pre-Internet era exposed many vulnerable machines. 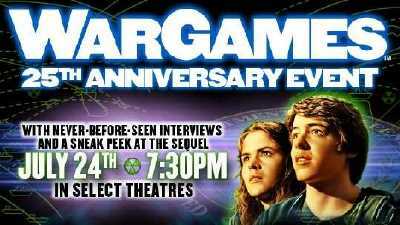 According to the Web site for the WarGames 25th anniversary event (which also gives a film synopsis — for all three of you who haven't seen WarGames yet), "The event will include never-before-seen interviews with cast and crew on how the movie was ahead of its time and its relevance today." Just as when Star Trek: TOS returned to theaters this past November, WarGames is a one-night, one-time-only engagement — one that happens to coincide with KansasFest, the only remaining Apple II convention. So I'll be seeing this film with folk who actually remember the days of the acoustic coupler and won't need to go far to research how accurate this film is! But every silver lining has its cloud: this celebration will include a preview of the sequel, coming to DVD a week later.